From time to time, we writers like to take the occasional break. Whether it’s a few weeks to let a manuscript cool or a summer off between projects, sometimes a little distance is nice. For fantasy author Richard Dalglish, a “little break” ended up lasting twenty years, culminating recently in the publication of his newly-released debut novel, Day of the Fastle, about a man with no memory who has only one clue to his identity: a four-sided insignia engraved on his sword and ring. Today, I’m talking with Rich (who also happens to be the copy editor who worked on my novel, Empty Arms and my forthcoming children’s series) to talk about his new book and his journey to publication. Enjoy! Erika Liodice: When did you start writing? Rich Dalglish: I started writing fiction in the eighties, but I stopped in 1998, when I got a new job with a long commute. I started up again in 2011 or 2012, when I was doing freelance editing and learned about e-book publishing, which I figured increased the chances of landing a book contract. EL: What inspired your interest in the fantasy genre? RD: I’ve had ideas for various genres, including mainstream, but so far only the fantasy ideas have panned out and resulted in full-length novels. I’d like to write a detective mystery, and, in a sense, the fantasy stories are all mysteries. I recently finished a novel that’s a fantasy police procedural. EL: What are your goals as a writer? RD: To create readable, well-written, well-plotted stories that engage readers and send them into an alternate reality for a while. EL: You’re also an editor. Tell us about the work you do. RD: I edit all the fiction for the e-book publisher 7-11 Press and also wrote a few seasons’ worth of episodes for two of their series, based on the publisher’s outlines. I also edit fiction for other clients and do nonfiction editing as well, everything from academic editing to college admissions essays to corporate newsletters. I once edited a business plan for someone in Fiji. EL: Is it challenging to be both a writer and editor? That is, do you find yourself constantly editing everything you’ve written? How do you separate the two? RD: I do find myself constantly editing everything I’ve written. I’m still editing Day of the Fastle, at least in my mind. But it’s also possible to separate the two and get myself into writing mode. As I’m sure you know, sometimes a story takes on a life of its own and seems to be writing itself, at least for short stretches. When that happens, my obnoxious editor self knows to leave my writer self alone. EL: How did you come up with the idea for Day of the Fastle? RD: The germ of the idea was so long ago that I don’t remember. I wrote the first chapter more than twenty years ago. EL: Is this your first book? RD: It’s my first published book, but I’ve written four novels, Fastle being the third. The first one is unpublishable (although I like some of it), and the second and fourth are related. I’m still trying to figure out which of those two to pitch first. EL: How long did it take to write Day of the Fastle? RD: About a year, as long as you don’t count the long hiatus in my fiction-writing career. EL: What was your biggest challenge during the writing process? RD: Trying not to be predictable. Maintaining the mystery element until the end without feeling as if I was cheating the reader. Trying not to waste time surfing the ever-present Internet. EL: Tell us about your writing process. RD: When I’m working on a novel I do try to write every day, for a good chunk of time. Probably around four hours, but I don’t keep track. I don’t have any rituals, but if you have any good ones, let me know. Could be fun. EL: What writing resource(s) have been most helpful to you during your writing journey? RD: Everyone who writes should read William Zinsser’s On Writing Well. It’s actually about writing nonfiction, but it’s a great book for anyone who writes or wants to write. EL: If you could give one piece of advice to an aspiring author, what would it be? RD: Writing is a craft as well as an art form, so while you’re dreaming up brilliant stories and assembling intricate plots, don’t forget about craftsmanship. You probably can’t learn to have a good imagination, but you can learn something about the craft of writing. Looking for a good read by a brilliant new voice? 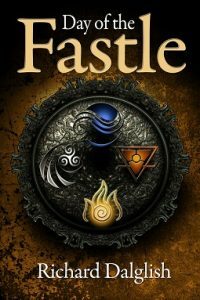 Check out Day of the Fastle by Richard Dalglish. Or…if you’re an author in search of a top notch copy editor, you can contact Richard at rich.dalglish [at] verizon.net to discuss your project.